Filmmakers Kurt Debaillie and Bjorn Verbeke invited me to the film set of their haunted house movie, Residual Residence. The majority of the movie was shot in the house of a recently deceased lady. To make the interior appear as real as possible, the filmmakers left almost all of the objects and furniture intact. 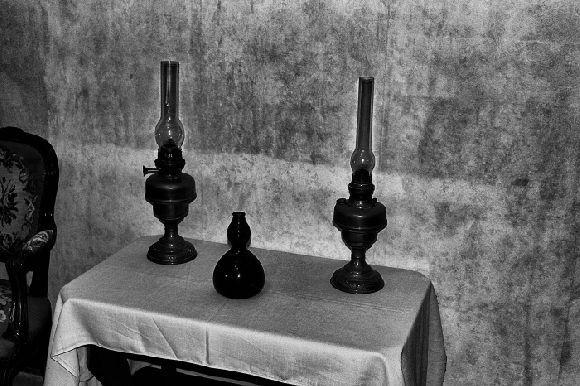 It soon seemed that not only the lady's belongings were still in the house, but the lady as well. Or at least, that's what it seemed like... 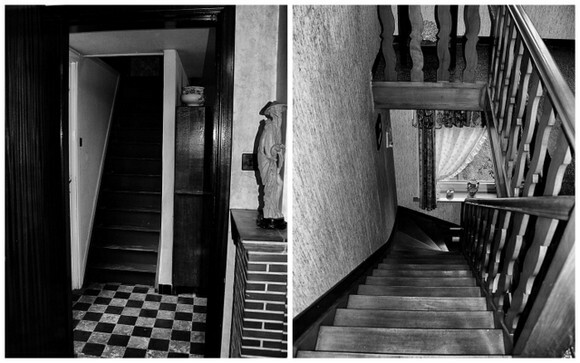 Sudden wafts of perfume on the staircase, classical music only audible through the headphones, strange noises, cell phones playing music by themselves, clocks chiming every time someone entered the house, and unexplainable lights. 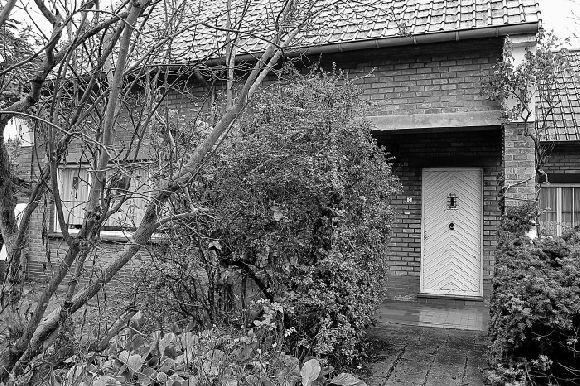 Fun fact: the house (which is situated in Bredene, Belgium) is currently for sale. What do you think of this peculiar movie set? The director and lead actor of Residual Residence will be following the conversation here, so leave them a comment with your thoughts or ask them a question. They will be happy to respond. scared! Glad you like Greece :) I am from mainland! found you on Thirsty Thursday. The set looks scary to me. Congratulations on your haunted house movie. I have a question for the filmmakers? What was your biggest challenge in the making of this movie? Thank you very much, Yvette. I had to reflect for a bit, before i could come up with THE biggest challenge on this production, because there were quite a few. But all in all, I'd have to say the biggest problem - and often biggest source of frustration - was lighting the area's we were filming in, so that the actor, who was supposedly walking around in the dark, didn't cast any hard shadows on the surroundings, while actually being hit by several 1000 Watts of light. Plus also in that aspect, hiding all the gear and lights in the shots. You see, since this was shot in an actual existing house, we were surrounded by a lot of shiny surfaces, like windows, high gloss varnished doors and stairs. All of those can reflect your gear and especially your lights. So before every shot, we usually spent several hours adjusting light setups. Pretty much every time the camera angle changed, the lights also needed to be adjusted. That is the big down part as opposed to working in a studio. There you'd have break away walls, no ceilings, any spot you'd need to hide your lights. In an existing house, where you can't demolish the place, you often have to get really creative to tackle this. Big productions with big budgets, just remove the shadows in post production digitally. We are working with no budgets. Paying for what we need ourselves, and mainly building what we don't have ourselves too. And 98% of the time it is just Bjørn and me, doing everything. So, no more crew than us two. You certainly have described all of the earmarks of a classic haunting. 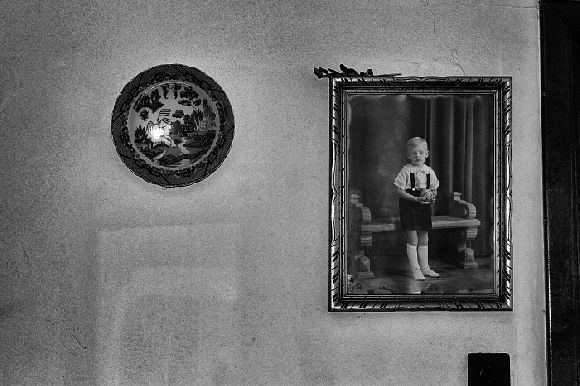 The picture of the little boy does appear to have a female figure standing behind him. It is hard to say whether that is a reflection of another picture in the room or the real deal. In any case, she does seem to have the same style of clothing and looks to be behind him. As far as the set goes it certainly gives off that creepy vibe and the trailer was very cool! Black and white was a homerun as a medium for the presentation in photos. Consider leaving a voice recorder or two lying around after you leave and even while you are there. You can also mark the floor near the doors to see if the doors move from their original positions overnight. Love your blog and it looks like you’re having a blast! They've picked the perfect house for the movie, it looks haunted! Wow love the pics, looks hauntingly eerie!! I think it's awesome and what a super cool oppt'y for you! There is honestly something about period houses that really make a scary movie. The wallpaper from floor to ceiling does it every time. Please come back Friday to see if you were featured! Good luck! Woah! There is a faint impression of someone standing behind the little boy. Very creepy!!!! I'm stopping by from the weekend blog post showcase! Thanks for linking up. That would be crazy if it truely was a haunted house! And the fact that it is being sold. P.S. That pic w/the boy truly is spooky. Hey Neely. Thanks for your question. As to how and why, that is basically one and the same answer. Before we started this project, we'd been working on a zombie short film. But that project proved to have massive production problems. The biggest of which were rain, getting all of the cast together to shoot at certain days, rain, not having any power sources in the field, rain, logistical problems and some more rain. So... that brings us straight into this project. We looked at all the things that went wrong on the previous one and decided not to have to deal with those problems again on this show. So in short : we film inside, where we have full control over the circumstances and have power for all our gear. And we cook up a story with an absolute minimum amount of characters... So, knowing this, what can we do ... ? 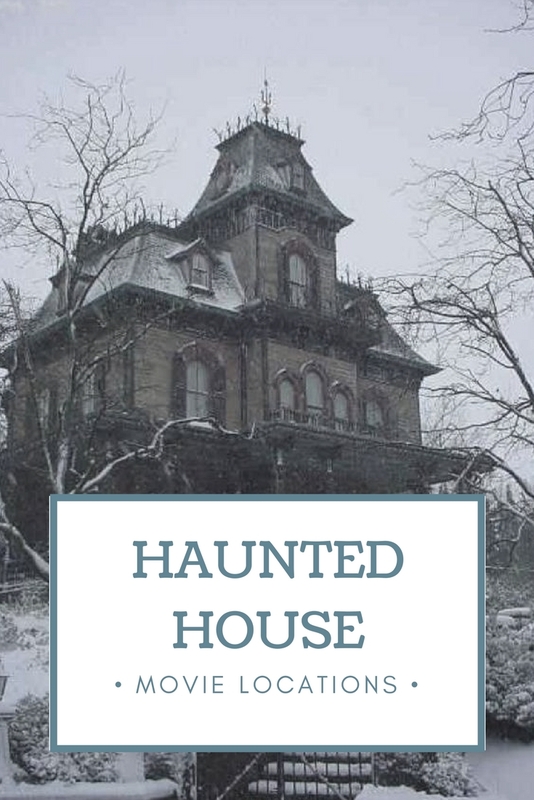 As I have an overactive imagination and my field is horror/thriller, I pretty much immediately came up with "let's do a haunted house film". That pretty much qualifies with all the previously mentioned criteria. So in no time I had a basic story ready, but still no location. We started looking around and all of a sudden it struck me. Within my very own family , we have this vacant house and it even looks the works. So I made some calls, explaining what we were planning and after a while we got green light. Then we prospected the house. Trying to figure out how certain rooms could work in our story, to flesh things out. 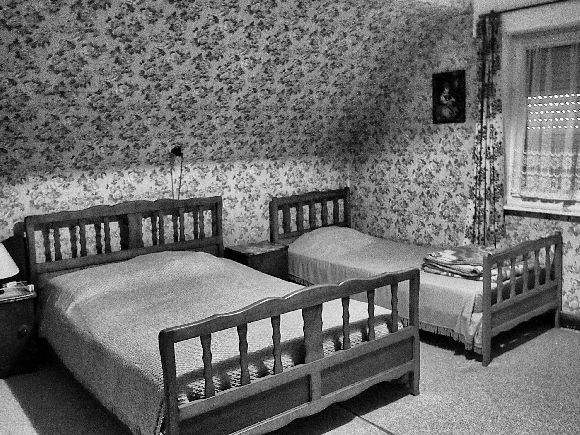 So the film is pretty much a written skeleton, fleshed out with what the house had to offer us on the scene in terms of lay out, furniture, ornaments, etc... Then followed a period of testing what would work and what not, effects wise. And finally we had to trim it down again. We had a lot of cool scenes with ghostly fx, but in the end there's a certain story to be told and it can't become an fx extravaganza. The fx have to serve the story, not the other way around. There isn't a lot we can tell you, without giving away any spoilers, since it's a short film and not a full feature length. if you want to know my opinion, I think that getting education is very important in modern world.https://pro-essay-writer.com/blog/critical-precis can help you with writing your academic papers.